After living in Los Angeles for a little more than six months, I’m absolutely loving the California indoor outdoor living. The breezes we’ve been getting lately have been heavenly and though the days are getting warmer, the evenings spent on the patio almost make up for it. Our backyard (which I still call it a yard) is definitely more of a patio than a yard. It’s mostly concrete but we made it more welcoming with some patio furniture and a faux grass rug (check out the before and after here). Since we use the space so often, we were in need of some additional seating. We opted to add a long bench, which can be a multipurpose piece. Since I love a good Ikea hack, I picked up the NORNÄS bench. It’s a long unfinished solid wood bench that can be used both indoors and outdoors that I made suit our style better with a few coats of Americana Decor Outdoor Living paint. This new paint from DecoArt is specifically made for outdoor use but doesn’t require a sealer. 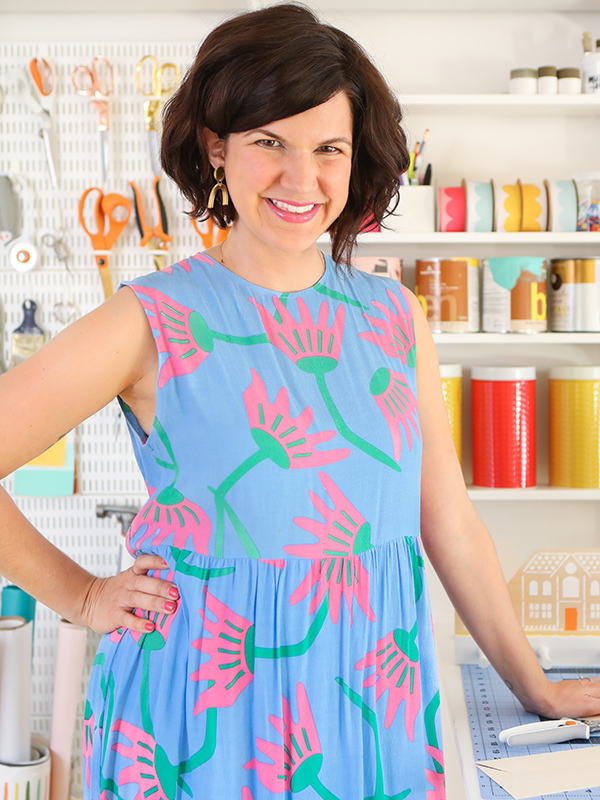 Just paint and go—which is definitely my kind of project! The paint also works on concrete, metal, terra cotta, plastics and more. 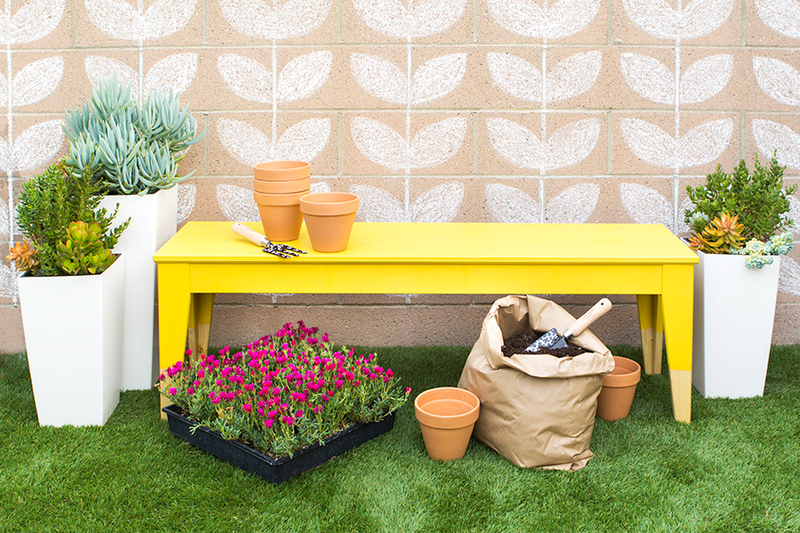 So you can pretty much use it for everything you’re going to DIY for your backyard. I’m a big fan of the paint dipped trend, but for the this piece I decided to reverse the look and paint everything except the bottom of the legs. And I’m happy I did! 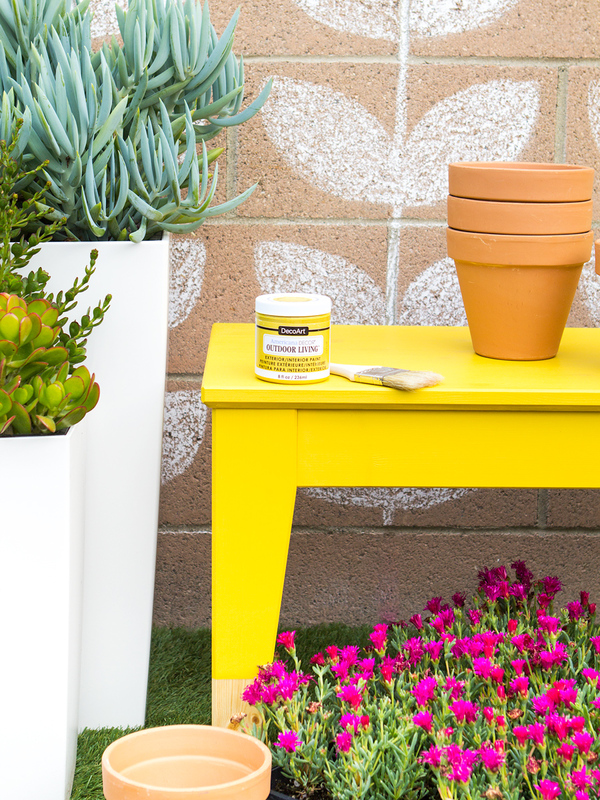 The pop of yellow looks great on our patio and the reverse paint dipped look adds subtle interest to the piece. Assemble the Ikea bench (I found this one to be one of the easiest Ikea items I’ve ever assembled). Use a dry rag to remove any dust or wood chips. Place the bench on top of cardboard or another surface to protect your floors from getting any paint splatters on them. Apply the painters tape to each leg so the top edge of the tape is 6″ from the bottom. Use your fingers to firmly press down the top edge of the tape. Paint away! I recommend painting the top of the bench in the direction of the wood grain, using long brush strokes. Allow the paint to dry (about 1 hour) and then apply a second coat. Since the wood on the bench is unfinished, it soaked up the paint a little more than usual, so I applied a total of 3 coats. If you prefer the paint to have a stained look, only apply one coat. Carefully remove the tape and allow the bench to dry overnight before using. Optional: I plan on using my bench outdoors, so I brushed on 2 coats of a basic satin finish polyurethane to the unpainted bottom part of each leg. This will help protect the unfinished wood from water and dust. Since our backyard is pretty small, we’re always moving things around depending on what we’re doing. I plan on using this bench for entertaining (hello summer bbqs! ), relaxing and reading a book, or even as a potting bench when I’m adding more succulents to my little patio garden. Love the stem pattern on the cinderblock? 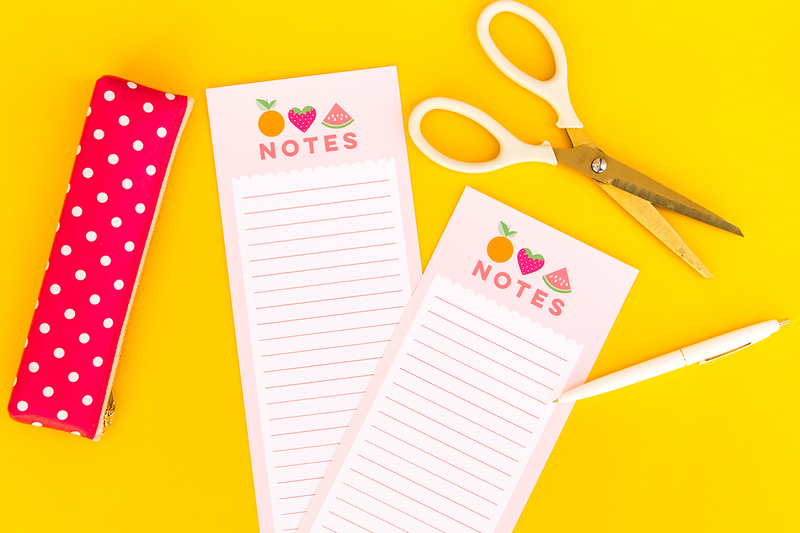 It’s as easy as tracing a template and coloring it in. 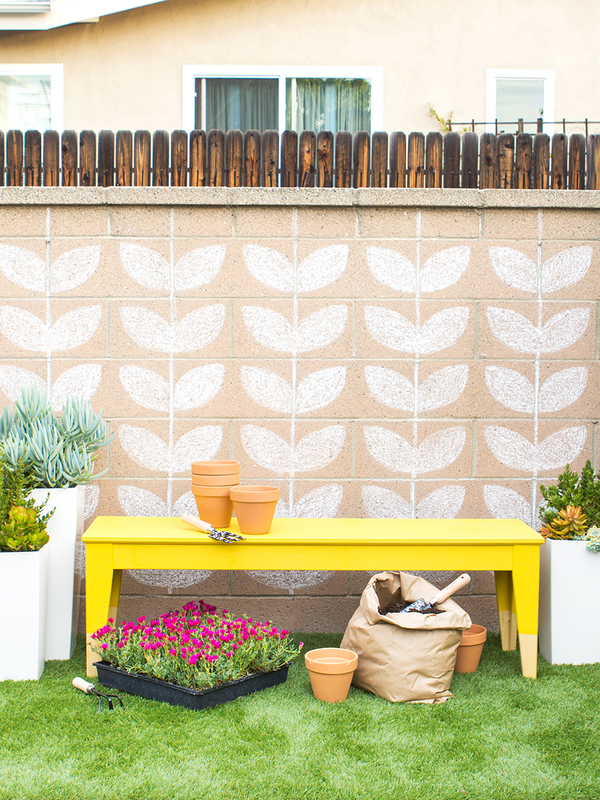 Check out the full tutorial for my patterned chalk wall. Very nice colour, looks amazing! I love that bright pop of yellow in your backyard! What a great and easy DIY. 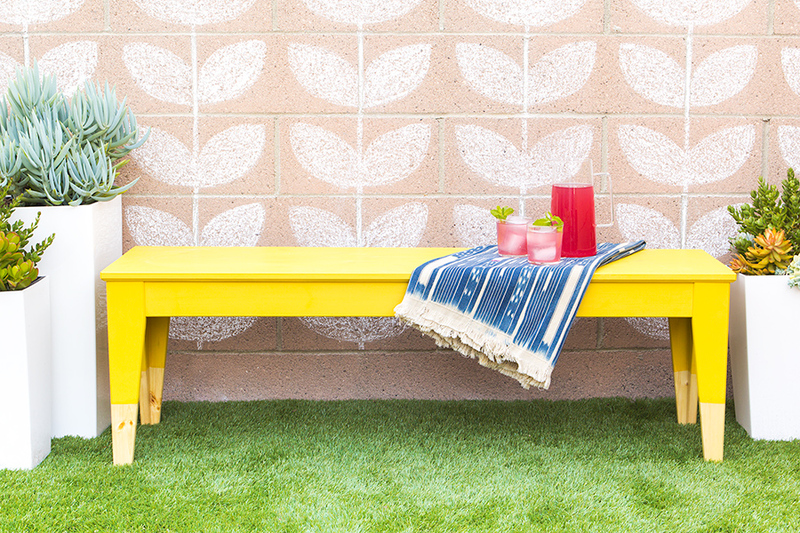 Your backyard is so cheerful with that bench and the chalk design. I love it!! Ho. Ly. Cow. The bench is so stunning, and that WALL!! !